Here’s another classic to add to the collection. It seems pretty appropriate that shepherd’s pie was a staple dish for us, at home on a sheep farm in rural Northumberland. I think this dish was traditionally made with left over meat from a roast dinner, but my Mum usually made it with our own lamb or mutton mince, which was a bit fattier than shop-bought mince and stronger in flavour; it was always really rich and filling. I’ve adapted the recipe here; instead of mince I’m using neck and slowly braising it on the bone. The neck is a pretty tough cut of meat so it needs cooking for a long time. It’s more flavoursome than the prime cuts, however, and absolutely worth the wait. Lamb neck is probably the tastiest part of the animal in my view, and very underrated. 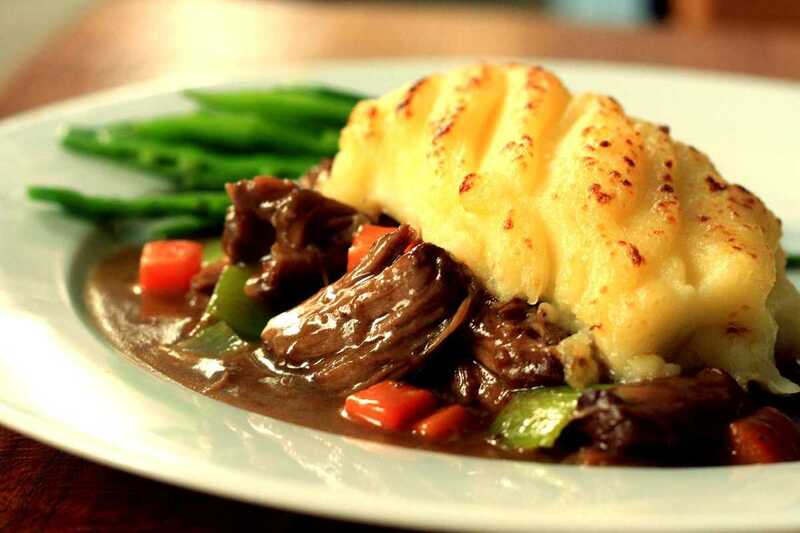 In the kitchen at work, we use veal stock as a base for most of our sauces; for something like this shepherd’s pie for example, we would make a rich jus from reduced veal stock to mix with the filling instead of gravy. The veal bones are slowly simmered in water for 2-3 days in order to extract maximum flavour and body from them. The gelatine extracted from the bones thickens the stock when it is reduced, so you get a naturally thick, rich jus without using flour. This is impractical to do at home, but you can get some way towards a proper jus when making a dish like this by cooking the meat on the bone, or adding extra bones to the braising liquid even. After reducing, the resulting sauce will be richer and have much more body to it. Heat the oven to 160C. In a large deep roasting tray, lightly brown 2 of the carrots, the celery, garlic and onion all roughly chopped, in olive oil. Add the thyme, rosemary and bay leaves. Add a whole bottle of red wine and boil for 3 minutes to remove the alcohol. Place a large, heavy based pan on a high flame and add 2 tablespoons of vegetable oil. When nice and hot, take the lamb necks and season all over with salt and pepper. Place the necks in the pan and fry until dark and caramelised all over. Now place the necks in the roasting tray with the wine and vegetables. Top up with water until all of the meat is just covered, bring to the boil, and wrap tightly with two layers of tin foil. Place in the oven for about 5 hours or until the meat is extremely tender and falling apart. While the meat is cooking, make the mashed potato for the topping; this can be done in advance, even days before if necessary. Take the potatoes, prick each one several times with a knife and place in the oven with the lamb for 3 hours; the potatoes should be thoroughly cooked through. Remove from oven, cut in half and press the potato through a sieve into a wide-based saucepan. Now gradually add the butter whilst beating over a medium heat. The butter will emulsify into the dry, floury potato and give a luxurious silky texture. Add a splash of milk and mix thoroughly. Season generously with sea salt. Transfer into a container and set aside for later.